It’s Tuesday! I’m posting something! Yaaaaay! For our first ‘Recommendation Tuesday’ I wanted to flag up a Visual Novel that’s been a huge influence on this story and especially my choice of setting. If you haven’t heard of a VN before, here’s a quick primer. I always describe it as a cross between a game and a “choose your own adventure” story – except that having said that, this VN is so much more than that. It’s called ‘Digital: A Love Story’ and you can download it for free from Lemma Soft Forums right here. ‘Digital: A Love Story’ is set “five minutes into the future of 1988” and deals with the main character’s (the player’s) first foray into the world of online Bulletin Board Systems. Unlike a more conventional VN which is told to you like a story and you guide the character through a series of decisions and actions, watching them play out in front of you, ‘Digital: A Love Story’ is totally organic. Well okay, the first five minutes are pretty linear, but after that you can literally do what you like. 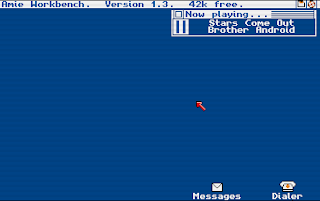 The game is laid out like an early computer system from the late ‘80s with a “desktop” from which you can access messages, run programs and dial in to BBSes. You start off by dialling in to your local board and chatting to a few users on there, then gradually accumulate more numbers and even *gasp* learn how to make fraudulent long-distance calls and hack private BBSes! Your actions are only limited by how many people you can talk to, and by the way, I recommend talking to everyone just to make sure you don’t miss a trick. You don’t get to read your own messages, but from their responses you can infer what you said to them. Watching the plot unfold and especially learning little details about the universe this VN is set in is totally fascinating. The soothing background music and computer-like layout both help immerse you in the world of the VN, and as the game goes along, you start to feel like you really are a 1980s cyber vigilante, befriending hackers and breaking into notorious online communities. (but with a basis in fact) from 1988. The landing page for 'Lake City Local', the player's local BBS. The problem with the amount of freedom the game gives you is that you are totally free to mess up, and mess up I did, the first time I played back in March 2010 (not long after the game was posted on Lemma Soft Forums. I was just starting to get into VNs and this was the second one I ever played, after ‘Re: Alistair++’). The mystery that drives the plot is not an easy one to solve; you have to be meticulous in following up all leads and remembering little tidbits of information that are mentioned casually in forum posts in case they become vital later on. I was upset when I realised I’d gone wrong somewhere and screwed up the game. I looked at a few spoilers in the Lemma Soft thread (a lot of people got stuck on the same thing that I did) and figured out where I might have gone wrong, but I didn’t attempt the game again until… NaNoWriMo 2012. Dun dun duuuun. I’ve always felt this really strong pull towards anything that relates to the early days of Internet. It’s a mix of longing, fascination and something that feels a lot like nostalgia. My own early Internet days only stretch back to the early 2000s: I remember dial-up tones and the heyday of AOL, when you couldn’t use the Internet and the phone at the same time, to say nothing of having multiple users on the Internet at once; but the golden age of BBSes and the beginnings of the World Wide Web were over long before I first logged in to cyberspace. Still, I wish I could have been online for a lot of what took place a decade or two earlier. So you can imagine what playing a Visual Novel which simulates the experience of being online in the late 80s did to my existing obsession with the early days of the Internet. I never forgot about ‘Digital: A Love Story’ even though I wasn’t playing it, and when I thought about writing a cyberpunk version of Peter Pan for NaNoWriMo last November, it suddenly popped back into my head. I’ll go into this more when I post ‘The Evolution of Setting’ (which might be this Friday’s post), but originally I was debating between a modern setting vs. a futuristic one for this story. Then the idea of setting it in the same time period as ‘Digital’ came to me like a master stroke. It wasn’t without its issues, many of which I’m still working out, but the idea was too compelling for me to pass up. After I made the decision to change the setting, I tracked down the original Lemma Soft thread once more, downloaded ‘Digital’ again and this time, I played it right. I completed it in one go and it was one of the most enjoyable couple of hours I’ve ever spent playing a game. A fascinating review of the game by Jason Scott, creator of textfiles.com (the BBS archive) and 'BBS the Documentary' which will feature in a future Tuesday post. What I wouldn't give for my work to earn that kind of commendation from a guy with those credentials. Man.